Danica is a Colorado native living in Minneapolis. 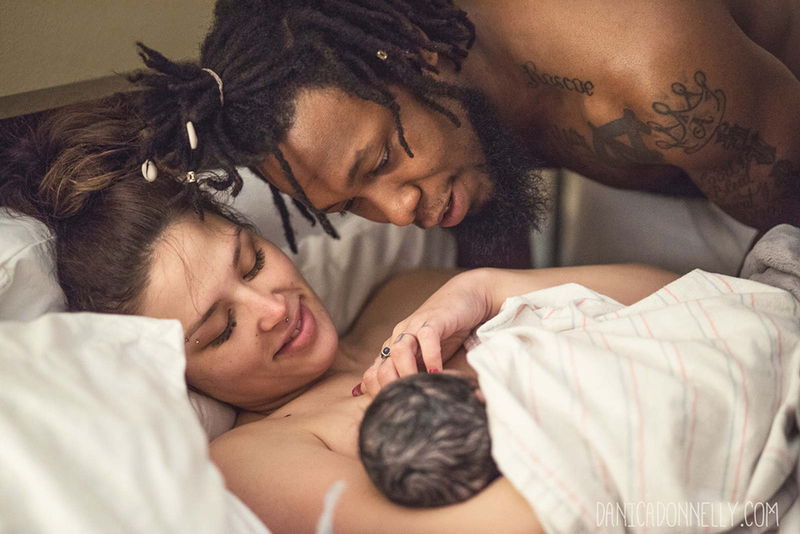 She has been shooting births for close to ten years and loves documenting the real moments that make up real connection and love. The message she spreads with each photo she takes is, "You Are Loved." Find Danica at the links below. Saturday, April 2nd was the day our baby boy was predicted to enter this world; that day came and went just like any other day. My mom texted me and asked me how I was feeling. I told her that I didn't feel any different than I did on any other day. We went on our weekly grocery shopping trip and went about our day as usual. Contractions woke me up at 3am on Sunday, April 3rd; the day that Chris predicted our baby boy to come, months earlier. I began timing my contractions quietly in bed, while Chris slept next to me; I didn't want to make a big deal of them until I knew they were not Braxton Hicks. I woke him up at 5:30am, and told him that I was having consistent, painful contractions. We called our Midwife and texted our Doula to let them know that I was in early labor. I got out of bed, made breakfast, and worked through my contractions. Late morning, we went for a walk, while my son rode his bike. We walked for about an hour, then went home to eat and lay down to rest. Later that afternoon, my midwife called to check on me. My contractions had been steady for most of the day, not really making any progress; she suggested that I take a triple dose of my calcium magnesium to take the edge off the contractions, so I could rest. About an hour after I took my calcium magnesium, before I could rest, my contractions took off. They became more and more painful and only a few minutes apart. At 8:30pm, we spoke to my midwife and let her know where I was at; she told me to call her and let her know whenever I was ready to go to the Birth Center. An hour later, I had Chris call our Midwife to let her know that I was ready to go. Although we only had to drive a couple miles, contractions in the car were torturous! We arrived at the Birth Center the same time as our Midwife; another midwife was there waiting, as well as our Doula. Soon after my arrival, I got into the tub with Chris, and my Doula contacted Danica. I started getting the urge to push, right away. It was such a relief to have the freedom and support to listen to my body, and do what felt natural. The pain was overwhelmingly powerful. I am so fortunate that I had the encouraging words of my Doula and Midwives. They helped me to stay in the moment and refocus my mind when I was starting to become consumed by the pain. My eyes were closed about 95% of the time...trying to stay in the moment. I remember hearing everyone around me, but all I could focus on were my contractions and pushing. I have always heard stories and read stories about how painful childbirth is, but I still wasn't prepared. I don't know if anything could have prepared me for that type of pain. My body wanted to run from the pain, but it's not something you can run from; you have to sit with it...wait it out. I don't recall how long I was pushing for, but I knew it was a while, so I asked my midwife to finally check me for the first time. She said that I was dilated to '10,' but his head was not moving past the anterior cervical lip. My midwife asked me if I wanted to try to not push through 3 contractions, while lying on each of my sides, or if I wanted her to hold the "lip" up and push his head past it. Since I was trying to avoid invasive interventions as much as possible, I opted to try to not push through contractions, while lying on my sides. Wrong! Haha. I could not stop myself from pushing through the contractions, and lying on my side was so painful. So, I allowed my midwife to hold the "lip" while I pushed his head past it; this was only a little less painful than the alternative. Once his head had made it past the lip, he began to come out more quickly. I remember reaching down and feeling his head full of hair. I was pushing with all my might, then I felt him drop out, and along with that came a tremendous relief. I heard my midwife tell me to reach down and grab my baby. Chris handed him to me and I pulled him up out of the water and leaned back on Chris. 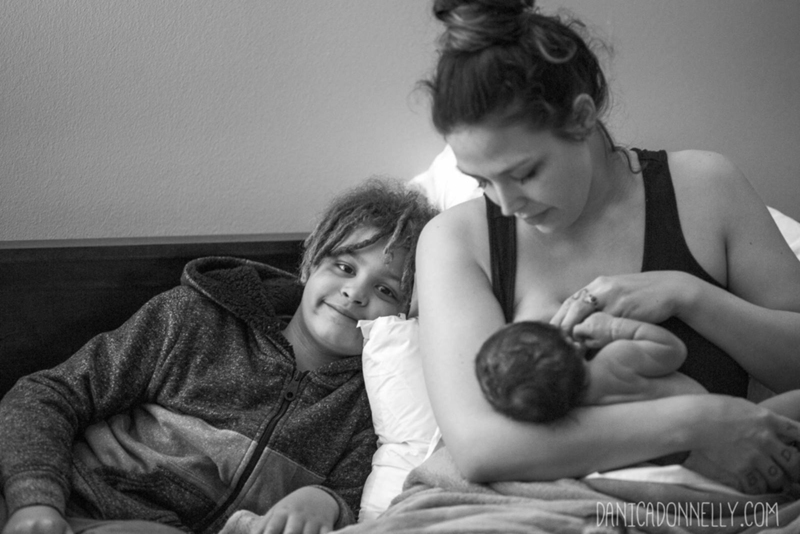 As we sat there holding our baby, with my son nearby and surrounded by the most beautiful souls, I had never felt more blessed than I did in that moment; the joy, the love, the gratitude. The support and encouragement that I received from everyone was overwhelmingly beautiful. If I bring another life into this world, I hope the experience will be just like this one.